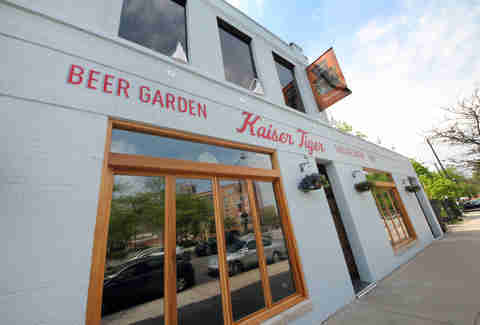 Punctuating the West end of Restaurant Row on Randolph St, Kaiser Tiger fills in the old Tasting Room space. On the way is a 50-person sidewalk cafe and a 200-seat beer garden in back with a dedicated garage bar. 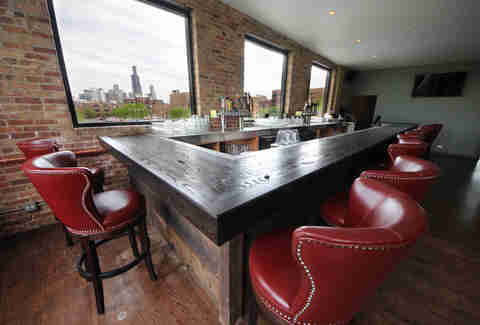 Inside, there’re two floors and another 240 seats, with the upstairs bar featuring a full skyline view (seeeeeee?). Fun fact: there have already been multiple inquiries into reserving the entire venue for beer & bacon weddings, aka the new Chicago standard for nuptials. 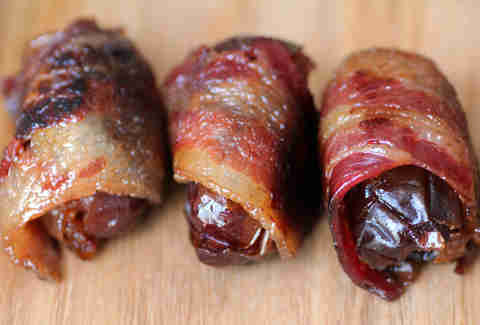 To ease you into the bacon-wrapping game, they'll ply you with apps like these brown sugar pork jowl-wrapped dates stuffed with Argentinean chorizo. 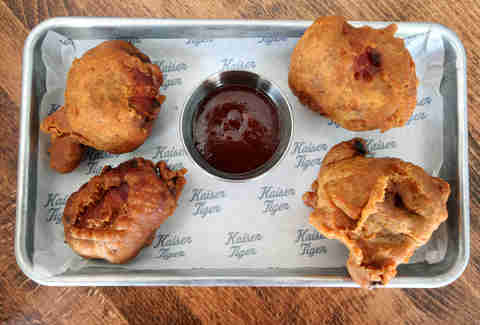 For your next war on vegetables, Kaiser'll arm you with bacon grenades: spicy beef and pork meatballs that're wrapped in bacon, beer battered, and deep-fried, then served with a house-made Three Floyds Alpha King BBQ sauce. 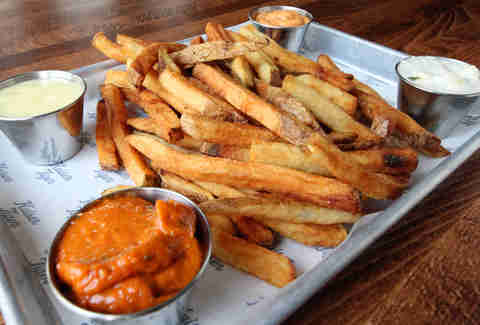 This large tray of Belgian-style French fries comes with your choice of dipping sauces: Cajun remoulade (nope), chipotle mayo (nope), or blue cheese bacon walnut (yuuuuuuup). 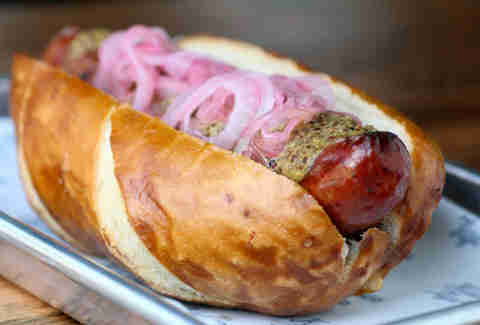 Reclaiming the term “sausage fest”, they've also got a varied cased-meat selection that includes a beer & bacon sausage, which mixes pork and Lagunitas IPA, is topped with picked red onions and beer mustard, and comes on a pretzel roll. 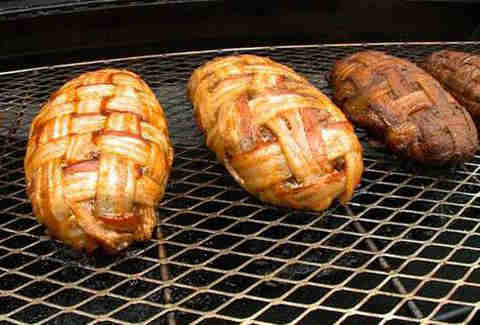 Oh, and it’s also wrapped in bacon. And then there's the Justin Bieber -- a big white brat (!) 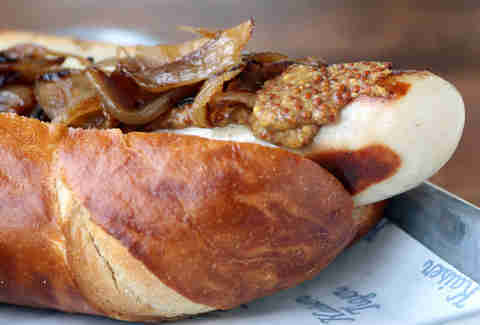 topped with beer braised onions and sweet mustard. 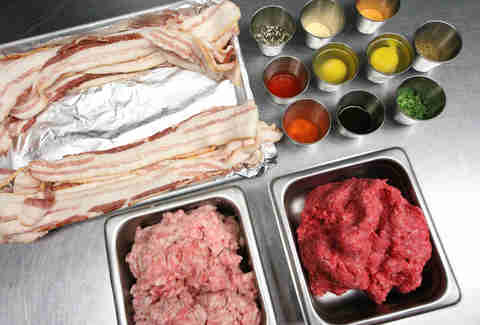 With a 24-strong tap beer list, you can order up a pint, or mix-and-match your own sausage or bacon beer flight. 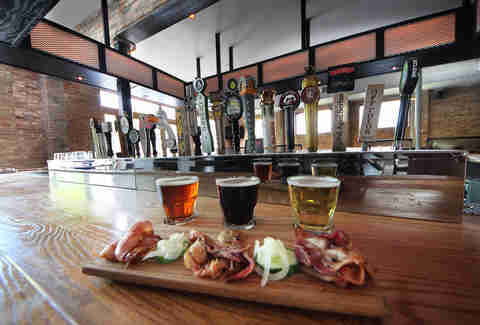 The beer & bacon flight includes a trio of pairings: Trumer Pils with cracked-pepper bacon, Off Color Scurry Nitro with brown sugar bacon, and Three Floyds Alpha King with sweet pork jowl. 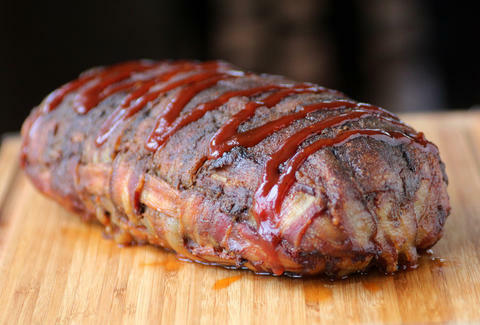 Meal time turns epic, though, once they break out the 5lb bacon bomb (a slice of which is available for sandwiches topped with pepper Jack cheese and house BBQ sauce). This monstrosity features 2lbs of ground beef, 2lbs of ground pork, SIXTEEN slices of thick-cut bacon, two eggs, and a blend of spices. 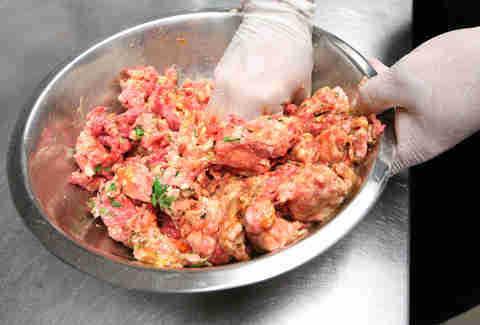 First, the ground meat and spices (paprika, horseradish sauce, Sriracha, etc.) are mashed up. 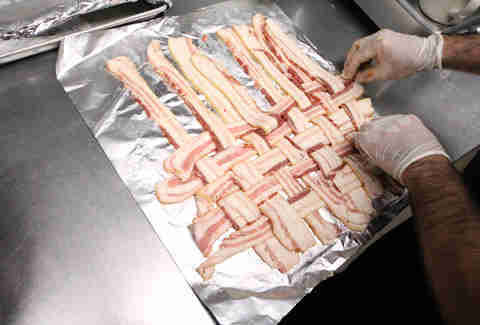 The bacon is laid out and woven together (bacon weaving > basket weaving). 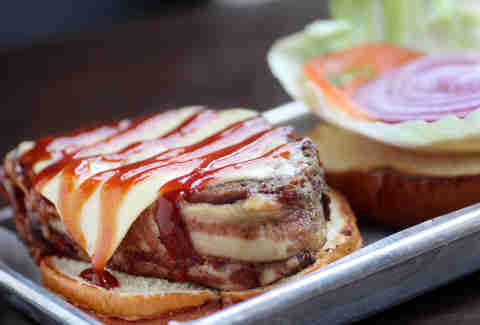 A secret recipe bomb sauce is rubbed on the weave, then the ground meat is placed on top with more sauce and a sprinkling of cracked-pepper bacon. 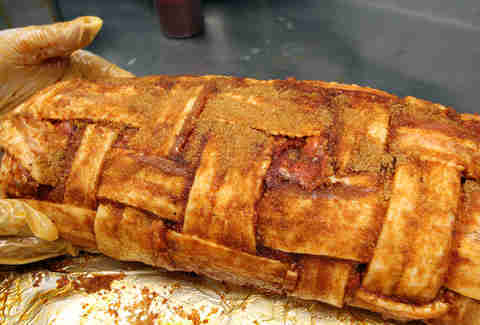 Once it’s rolled up, the bomb gets a brown sugar massage and moves over to the smoker. The bomb will sit in a hickory wood chip smoker for three hours before being served up to a party of 6-8 people or one Norse god.